Not that I really know what to do with hashtags, but…anyway. 1) I’m in the best shape of my life having maintained a 40 pound weight loss for the past 4 years. 3) I arm myself daily with Stuart Smalley affirmations- “I’m good enough, I’m smart enough and doggone it, people like me.” If you don’t know who Stuart Smalley is, Google the Saturday Night Live skits, they’re good for a laugh, or at least I think so. 4) I know deep down in my soul that God loves me for me. [pullquote width=”300″ float=”right”]Some days I just need to slow down, to bask in and be awed by His great love for me. To remember that I am a unique creation, a one of a kind original work, signed by God, sealed with love. [/pullquote]As I write this, I’m irked at how far I’ve come yet how (obviously) far I need to go in showing myself some love. I’m agitated at this whole situation because my belief system says otherwise. I believe that God not only surrounds me, He is within me. Therefore if God is love, love is within me. His love is within me. Through Him I have love for those who are easy to love and also practice loving those who are a little more challenging to love. I really do work at this. Within my family, friendships, workplace, heck even at Target when I want to run someone over with my cart or at least nip their heel. Don’t judge. Grace. Acceptance. Remembering that everyone has a story that runs deeper than we might ever know. Unconditional Love. Meeting people where they are and loving them for who they are. Why then on some days is it so hard to be more loving to myself? I am SO thankful for the gift of life. I’m thankful to be here, I am grateful to be me, to have this life. Navigating a chronic neurological condition since 2001, I cherish each day God gives me and the gift of good health. I truly do celebrate life. It’s one of the reasons why I want to go back to school to become a Wellness Coach. I want to help others to be well, to live well. One of my missions is to help others to “love themselves where they are while helping them to become who they want to be.” Every day I want to live my life with a sense of urgency and the desire to honor God with my mind, body and spirit. Some days I just need to slow down, to bask in and be awed by His great love for me. To remember that I am a unique creation, a one of a kind original work, signed by God, sealed with love. How crazy is it to think that God rejoices over our lives? That He celebrates who we are? And so today I celebrate my selfie. I will love myself where I am while working on who I want to be. Celebrating that I am healthy, I am whole. I am His and I am me. Basking in His love feels so good, scratching my head as to why I don’t do it more often Ruth. “How crazy is it to think that God rejoices over our lives?” Really, how crazy is that? And how wonderfully safe to know that our lumpy, bumpy bodies are loved, rejoiced over even. Thanks, Tara, for the reminder that through all of selfCrapping, we are loved. So loved. Self-crapping, now that’s a visual. All of our lumps and bumps are made for a purpose, and they are loved, so loved. I feel like I haven’t “seen” myself in 10 years so I really have a hard time with my selfies. Working toward finding myself again and hoping to “celebrate my selfie” sooner rather than later. I need to read this again! Isn’t it odd how in God’s eyes, yours is the body of a beloved survivor, and yet you don’t see that in the mirror? NOT poking at you, friend. Just amazed at how easy it is for all of us to focus on the outside. Darn it. I do it, too. You are so lovely Jen! To echo Gretchen’s sentiment, after all of the loss I’ve experienced in my life I get so agitated when I focus on stuff like this. At least I stop and catch myself now, I’m a work in progress. Yes! When I start the negative self talk I think of God shaking His head. After all I’ve given, why can’t this girl just feel loved and love who she is? And most days I do, and some days I’m a goldfish. Gonna keep on swimming though, swimming in His love. You said it Amber- balance. Constantly trying to juggle the idea of self improvement and self love. Of striving to be better yet be content. So glad that God is the Ring Master of my juggling act. I love this so much, for so many reasons. Physical, spiritual, etc. And I just love how God rejoices over us with singing! Glad you enjoyed it Natalie! 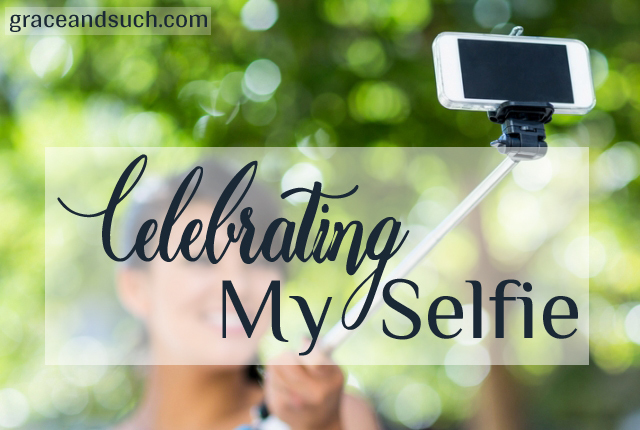 So much to love here, Tara–selfies, Stuart Smalley, great song lyrics, and that particular Zephaniah quote! I love all these things. I know! Why on earth do we constantly beat ourselves up? We wouldn’t say these things to others (hopefully)(well maybe some days). So thankful that He loves me for me.